The trial of the Billionaire kidnap kingpin, Chukwudumeme Onwuamadike, a.k.a Evans, continued on Wednesday before the Lagos State High Court, Ikeja. The prosecution played a video which captured Evans confessing to kidnapping and armed robbery. The State Director of Public Prosecution, Ms Titilayo Shitta-Bey, who led the prosecution, demanded that the video clip be played. In the video the kidnap kingpin was fielding questions from a police investigative officer, Inspector Idowu Haruna. The video was played in the course of Haruna’s testimony in the case on Wednesday. Prayer by the prosecutor that two compact discs containing the clips be admitted as exhibits in evidence against Evans and his co-defendants was, however, opposed by Evans’ lawyer, Mr. Olukoya Ogungbeje, who said he needed time to scrutinise the CDs. “My Lord, we will be requesting for time to call our technical experts to examine the CDs played in court today as well as the certificate of identification served on us in open court,” Ogungbeje said. In his testimony, Haruna, who was led in evidence by Shitta-Bey narrated, “I’m a member of the Inspector-General of Police, Intelligence Response Team. I know the defendants from when they were arrested for the kidnapping of one person on February 14, 2017. “That victim was taken to their hideout in Igando, Lagos and kept there for a month till he escaped from the hideout. “Through covert operations, we arrested Evans and during interrogations he mentioned Victor Aduba. 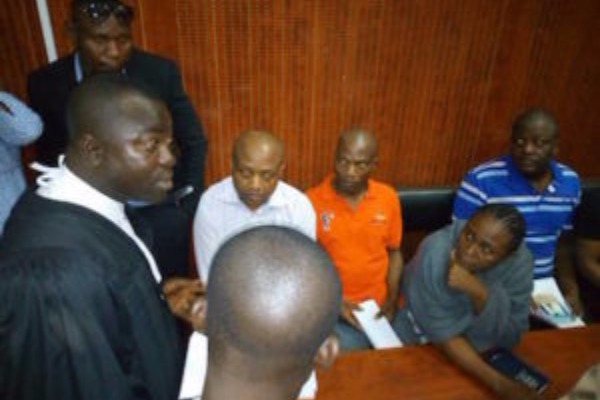 “The first defendant (Evans) gave us information about the people he had kidnapped in Lagos and in other states. “He confessed that on June 28, 2014, at Saka Street, Amuwo-Odofin in Lagos, he was armed with an Ak47 gun and he kidnapped Mr. Sylvanus Ahamonu, and took him to their hideout in a danfo bus. “After holding the victim for nine weeks, they contacted his family demanding $2m with the family agreeing to pay $420,000. “The family paid the $420,000 in installments. “After Sylvanus regained his freedom, he gave a statement to the police; his wife Mrs. Chinyemere Ahamonu, who negotiated his release, and his brother, Dominic Ahamonu, who dropped off the ransom, all volunteered statements. “The first defendant (Evans) was cautioned in English language and his statement recorded by our video recorder which took records of the interview. Further proceedings in the case were adjourned till April 23 and 27, 2018.